1.water head from 10m to 300m. 2.is characterized by reliable operation, simple construction and high efficiency, etc. 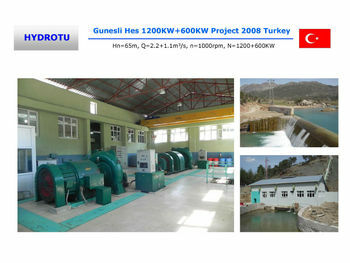 Francis turbines of both vertical and horizontal types are suitable for water head from 10m to 300m. lts feature is that the water flow enters the runner inward in a radial direction , changes direction gradually and then passes out axially. Francis turbine is characterized by reliable operation, simple construction and high efficiency, etc. Normally, we adopt the horizontal Francis with capacity below 5MW, runner diameter below 90cm.